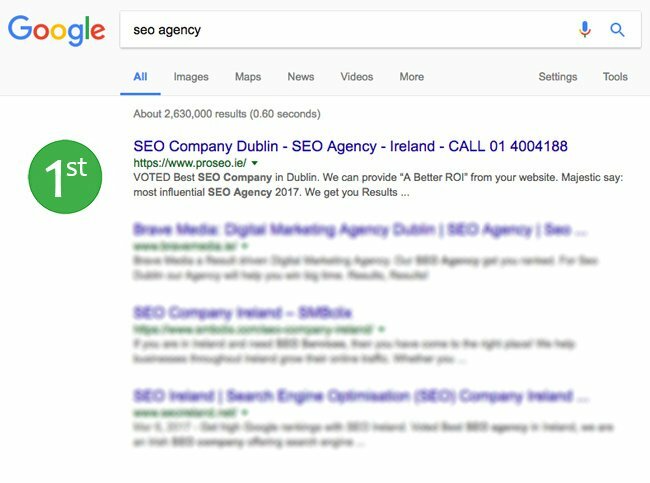 Top Ranking Irish SEO Services for businesses that are serious about reaching Number 1 on Google. We offer effective (SEO) Search Engine Optimisation for your website. “Your website doesn’t appear on Google for the searches you want”? Don’t Worry PRO SEO Ireland can get it sorted for you Now. Let us take a quick look at your website’s SEO ( Search Engine Optimisation). We will give you a FREE Analysis report on how you’re website is doing and whether it is Ranking in the SERPs. Don’t let your website suffer from bad Rankings anymore in Google, ACT NOW! Starting from now you can get those searches you’ve always wanted. Resulting in more customers and Lots more sales. 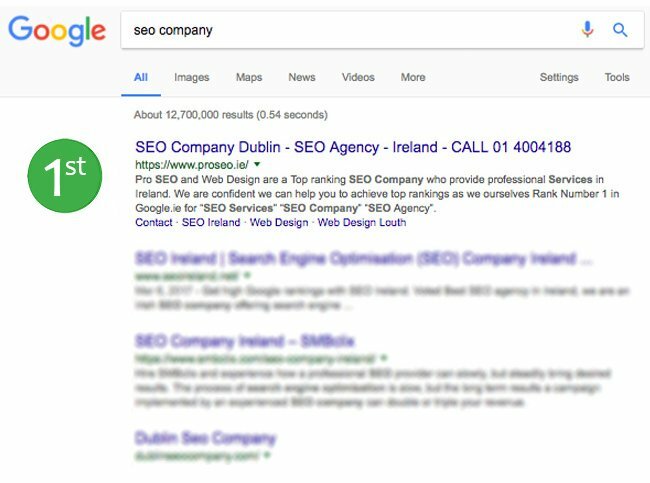 Contact PRO SEO Ireland Today and get your Campaign Kicked off to a flying start. Web optimisation is a common term used by website operators or owners. This is because it is used to increase web traffic to your site. Statistics has revealed that many people tend to use their mobile phones more often compared to their computers. Websites are commonly used by companies or institutions to pass certain information to their targeted audience. People also use them for various reasons ranging from downloading apps and songs, making payments and getting certain information among others. If they are not optimised properly, they can be difficult to use on mobile phones. Improved user experience – Using desktop websites on mobile phones is very challenging. It makes navigation through them very difficult. When it is optimised correctly, it immensely improves users experience in various ways. Users can easily navigate through mobile versions without any complications. Brand identity as earlier stated, most people tend to use mobile phones. Brands who sites are mobile friendly can easily gain popularity as a person can easily navigate through them. It has been proved that customers like visiting brands’ websites that have are mobile friendly. When they are search engine friendly, they become easy to navigate through by mobile phone users. As a result, users can get the information they are looking for within a short period. Convert users into potential clients – Mobile optimization has been proved to enable customers access information within a short period. It has been proved that customers love websites that are easy to navigate. Most of these users can easily convert into potential clients. Find out how you can Rank Top of Google in Ireland! The most common reason why business people improve their websites is to gain more web traffic. High web traffic is very indirectly influential in the success of an online business or service. Websites which are mobile optimised tend to attract many mobile users. Mobile sites are mostly preferred compared to desktop versions. When many visitors use a website, it gains more traffic. Web traffic plays a great role when it comes to increasing the PR rating on Google. When the traffic increases, ratings, and conversions should also increase. The advantage of a high PR rating is that it makes a website more visible to the public. As a result, the sales of a brand might drastically increase. Sounds good, doesn’t it? There are many things affect the ratings of a website. They range from content among others. There are some factors a person needs to put into consideration before choosing a mobile optimisation. Regular SEO Maintenance ensure’s your website achieves first-page listings and keeps them. After a full SEO analysis, we will recommend the best-suited SEO approach to be carried out on your website. Our aim is to put your website on the first page of Google for the keyword search terms that are related directly to your website. Getting your website to the first Page, top 3 for high Converting keywords will bring you the business and ROI you’ve always wanted. PRO SEO Ireland offer an extensive Maintenance plan for your website, As when you get to the top you`ll want to stay there! We will monitor your websites progress ensuring that you keep your position and grow your position by tweaking your Search engine optimisation as the Search engines change their Algorithms like Google, who can have up to 3 Algorithm changes per month. You will receive an SEO report Weekly & Monthly on your SEO Campaign. Maintenance plans start from €199 per month. Even though the evolution of digital marketing has changed in recent years, it is still as important as ever to obtain natural links that are Penguin friendly. There are no black hat tactics used by our digital marketing agency, just natural link building that will give you sustained positive results. Our current methods have proven to deliver unbeatable results for our clients, this is due to our huge effort put into creating natural penguin friendly links to your site. We gain immense leverage through your social profiles, complimenting them with social signals. Effective internal linking on your inner pages has got greater importance in recent times also. Our main focus is on quality, not quantity keeping away untrustworthy sites. The final piece is making sure your content is link worthy, ensuring your visitors like the page content to reduce bounce rates. Description: PRO SEO and Web Design are a Top ranking online marketing Company who provide professional SEO Ireland services. 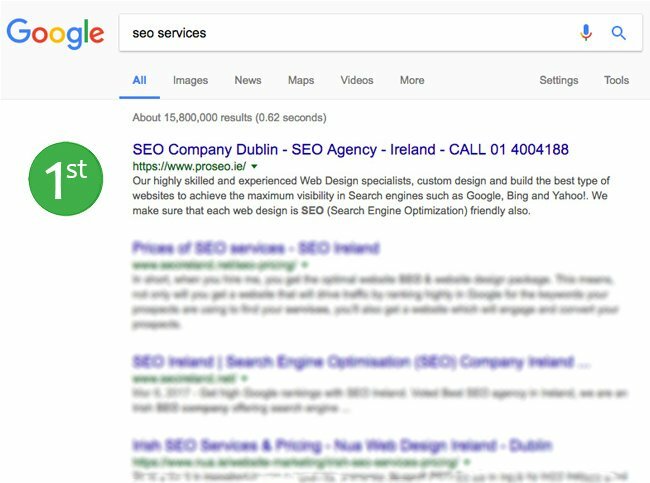 Product Description: PRO SEO Ireland and Web Design are a Top ranking online marketing agency who provide professional search engine optimisation services in Ireland. Review: This company raised my position on Google to the first search page and I was nowhere before that, very professional and guided me all the way.